Hand of Jessee Horror: "of the wants, of Tarrare." The sisters collect all the creepy things they find. "of the wants, of Tarrare." Read the full text on Google Books. The account of Tarrare begins on p. 203. He could eat a meal for 15 laborers. He ate live snakes and dead bodies. He may have consumed a living child. Welcome to our first Matter-of-Fact Monday! The day of the week where everything we talk about is true! Or at least based in reality of some sort. While the rest of the blog is dedicated to creative work in our favorite genre, you can always rest assured that Mondays will give you a dose of true-life horror. So, let's get on with learning about one of the most bizarre and creepy individuals ever to wander through France. There are many articles dedicated to the man known as Tarrare. Most begin with his humble birth in the French countryside around 1772. Then they cover his stints as a travelling geek, swallowing corks, rocks, and live animals as the warm-up act to a "charlatan". And there was his brief service as a spy for the French Revolutionary Army (they made him swallow messages, of course). 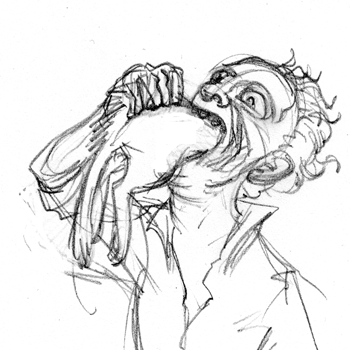 But most stories about Tarrare focus on one thing: his insatiable hunger. What more can I add? Other authors state the facts clearly and simply, as if to emphasize the reality of the account. Which isn't really a bad idea, considering that the story of Tarrare is so deeply unbelievable. The mind cringes away from it, dismisses it as a work of macabre fiction. It can't possibly be true. But M. le Baron Percy, Tarrare's doctor and author of the account, was a well-respected military doctor of the time. An overview of his other reports show that he was not given to flights of fancy. If Tarrare was a hoax, it would be quite out of character for M. Percy to perpetrate such a thing. This leaves us with an uncomfortable notion. My intent is to do the opposite of these previous articles. Where Wikipedia and the beloved Fortean Times treat Tarrare as a curiosity, albeit a disgusting one, I plan to retell the tale of Tarrare in all its horrible glory. 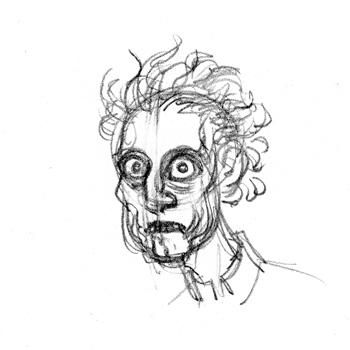 Tarrare was hideous and scary. Understatement may inspire respectability and a slow-burn sort of dread. There is an argument to be made for rendering Tarrare as a sympathic, human oddity. But, remember, he probably ate a child. Let's begin with how he looked, his physical existence. Tarrare was a medium-sized man, perhaps 5'6", slender and meek. It is said that he was "almost devoid of force or ideas." Save eating, of course. At the age of 17, even after years of gluttony, he weighed only 100 pounds. He was balding: "the little hair he had preserved, although very young, was very fair and extremely fine." His teeth were streaked "like marble." His cheeks were sunken, wrinkled, and hung limp from his face. This was a direct result of Tarrare's ability to open his mouth and fill it with a dozen eggs or apples at a time. His lips were barely visible, but his mouth was very wide. Tarrare could open his mouth so wide, in fact, that a cylinder a foot around in circumference could be placed inside without touching the roof of his palate. At his autopsy, it was found that when Tarrare's head was tilted back, a straight canal was formed down his enlarged esophagus directly to his stomach. The doctors were able to look in his mouth, down a tunnel of flesh the width of a softball, and see his stomach. Tarrare's stomach was capable of distending to such a massive, bloated form, that when he was not full of food, the skin of his abdomen fell saggy. There was such an excess of it that he could wrap the flap of skin most of the way around his body. Now, you might be thinking to yourself that Tarrare may have been a sufferer of any number of syndromes that attack the connective tissue in the body. He must have had a genetic defect that caused his joints, skin, and tissues to stretch and unhinge in such a manner. But, no. According to the account, Tarrare had no loosened skin, no joint-trouble, no sprains or unusual flexibility, aside from those related to his constant eating. His mouth, jaw, esophagus, and distended stomach were the result, not of a medical abnormality, but of constant strain and stretching. But the disturbing truth of Tarrare's body doesn't end there. He constantly sweated and was burning-hot to the touch. Tarrare literally steamed. M. Percy, his doctor, described that from Tarrare "a vapour arose, sensible to the sight, and still more so to the smell." In fact, Tarrare smelled so bad that people had a hard time getting within twenty paces of him. His excrement was described as "fetid beyond all conception." And the stinking vapour got worse after he'd fed. During his rare times of extreme satiation, Tarrare's eyes would turn a vivid, blood-shot red, his cheeks would flush, and he would fall into a deep sleep to digest. He would burp and move his jaw in chewing-swallowing motion, though M. Percy found no signs of actual rumination. That's what Tarrare was. Now, let's look at what he did. -A quarter of a bullock in a day. -small boxes containing military messages. Not so bad. Typical side-show fare. But wait, there's more! So he liked his meat raw and kind of rotting... so? Well, let's mention the things he consumed during his stay at M. Percy's hospital. When he first arrived at a military hospital in Soultz, he ate 4 meals himself, the other patients leftovers, kitchen scraps, and turned to the apothecary's room. Therein he ate all the poultices. Poultices being a moistened, mashed mixture of plants, flowers, flour, mud, ash, or other ingredients. Tarrare was later found sipping from bowls of blood from blood-letting patients. The staff surprised him in the midst of his consumption and sent him back to his room. Later, they found Tarrare in the morgue, eating parts of dead, rotting bodies. He was allowed to wander the halls of the hospital at night, breaking into offices, sneaking into rooms to lap at half-coagulated bowls of diseased blood. He crept into the morgue to eat corpses. The last straw was when a 14-month-old child went missing. Many accounts describe the victim as either a baby or, as I just did, a 14 month old. But this misses the point. Children routinely learn to walk by twelve months old, a year that is. This was not a small, ten-pound swaddled baby, or a collection of months. This was a toddler. Sure, someone may have kidnapped the child, or it may have wandered out on its own. But the staff immediately suspected Tarrare and threw him out as a result. We do not know for sure, and the thought is beyond real conception. But it's possible. A child that was heavy and could thrash its limbs about. A child that was learning to talk. A child that may have tried to run. In a stroke of irony, Tarrare died at 26 from consumption (tuberculosis) and diarrhea. Doctors had to work quickly as a strange corruption instantly began to decompose his body at an accelerated rate. When they autopsied his body they found his intestines were putrefied, tangled, and oozed pus. His liver and gallbladder were enlarged and putrid. His stomach was covered with ulcers and filled almost all of his abdominal cavity. This was all they found, as the stench of his body rendered the doctors unable to continue. Tarrare was a man made to consume. He ate so much it warped his body into little more than bones surrounding a gullet and stomach. He was a gaping mouth that swallowed contagion, rot, and living creatures. "Let a person imagine," said M. Percy, "all that domestic and wild animals, the most filthy and ravenous, are capable of devouring, and they may form some idea of the appetite, as well as of the wants, of Tarrare." P.S. Special Thanks to Caitlin. The Cat Eaters by Jan Bondeson. Thank you for writing on this! Tarrare is probably my favorite historical...uh...is there a word that conveys the same joyful interest as "crush", but with revulsion instead of infatuation? Yay! I'm glad you enjoyed it. Perhaps "sludge" is a good alternative. As in, "Man, I'm totally sludging on Burke and Hare these days..."
Click for new episodes of horrifying and true content every Tuesday! Original content copyright Amanda B. and Joanna R.. 2013-2015. Awesome Inc. theme. Theme images by digi_guru. Powered by Blogger.